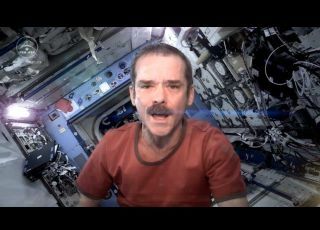 As a final farewell to his life on board the International Space Station, Canadian Space Agency astronaut Chris Hadfield covered David Bowie's "Space Oddity" from orbit. After five months in space, an astronaut is saying his goodbye to the International Space Station with a classic performance of one of David Bowie's cosmic classics: "Space Oddity." In new music video from space unveiled Sunday (May 12), Canadian astronaut Chris Hadfield sings David Bowie's "Space Oddity" in a visually striking performance recorded in anticipation of Hadfield's return to Earth today. The astronaut's version of the 1969 hit stays true to the original song in many ways, but Hadfield does take some liberties with the lyrics. While Bowie's "Space Oddity" is about a space mission gone awry, Hadfield's version is specifically tailored to his time on the station. "Lock your Soyuz hatch and put your helmet on," Hadfield sings of the Russian rocket that is scheduled to bring the astronauts down from the orbiting laboratory. "Ground Control to Major Tom: Commencing countdown engines on. Detach from station and may God's love be with you." This is not the first song that Hadfield has sent back from orbit. In December, at the beginning of his life in space, Hadfield unveiled "Jewel in the Night" — a holiday-themed tune that became the first original song recorded on the station. Hadfield has also sent back videos explaining everything from how astronauts make a sandwich to how they cut their nails in microgravity. He was also very active on Twitter, posting photos and information about his unique vantage point above the planet daily. Hadfield, NASA astronaut Tom Marshburn and Russian cosmonaut Roman Romanenko are getting ready to board their Soyuz capsule for a planned landing on the Central Asian steppes of Kazakhstan at 10:31 p.m. EDT (0231 May 14 GMT) today. The astronauts will undock from the station at 7:08 p.m. EDT (2308 GMT). You can watch the Soyuz landing live on SPACE.com via NASA TV. The departure of the three Expedition 35 spaceflyers will leave three crewmembers on the station until a new crew of three is launched to the station at the end of the month. "You, the crew of Expedition 35, have been nothing short of tremendous," Mission Control officials radioed to the station crew. "Not only have the efforts of Expedition 35 been extraordinary, but you've manage to bring us all along with you on your space odyssey."